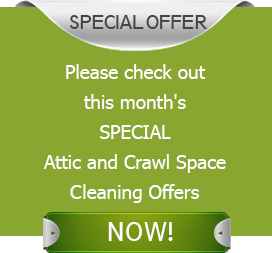 Despite being an integral part of your home, the attic and crawl space is generally ignored and often becomes a dumping ground for all kind of junk. Homeowners can pay a big price for this laid back attitude. Overlooking these functional areas can have an adverse impact on the rest of the house causing poor indoor air quality, health hazards as well as expensive repairs. Regular inspections of homes and commercial set-ups are imperative to identify potential problems before they become serious. Catching and fixing problems early on will protect your family and save you money before costly repairs become prohibitive. If you want the best in residential or commercial cleaning services for your attic and crawl space, look no further than Quartz Solutions! Our proficient staff armed with advanced techniques will guide you through the process and provide the appropriate solutions. If ignored, attics and crawl spaces provide the ideal conditions for a wide-scale project of expensive repairs that will burn a big hole in your pocket to get things in order. Mold, mildew, fungus and other germs flourish in conditions where humidity levels are high. These microscopic, living organisms destroy carpets, furniture, cabinets, and even structural elements of your home. Fleas, spiders, roaches, wasps and termites are germ carriers and can be particularly dangerous for people with allergies or weakened immune systems. Leaky ducts and faulty insulation can have a significant impact on your utility bills. Animals like rodents, squirrels and mice are a concern because they may gnaw on your stored treasures, wooden boards, exposed electrical wires which might cause a fire. Also, they leave behind filth and a smelly clutter in the form of droppings and urine that can compromise the health of the residents. Understanding all the perils and dangers that are thriving in your attic and crawlspace is important for monitoring, maintenance and improvement of your property. Quartz Solutions will call and set up a time to conduct a free preliminary inspection. This will involve testing for toxic gases and a thorough check of your attic and crawlspace inside and out. Our skilled crew will evaluate the situation, explain the causes of the specific problems and chalk out a plan to tackle them in the most cost-effective, un-intrusive way possible. Quartz Solutions takes pleasure in making customer satisfaction our first priority. Our staff employs time proven techniques for fixing attic and crawlspace at competitive rates. We offer services that will not only meets but exceed all your expectations. Guttenberg, in Hudson County is one of the smallest municipalities in New Jersey. Created from a section of North Bergen Township it was named after a German word which meant “Good Mountain.” Guttenberg residents and business owners can trust Quartz Solutions to take care of all their attic and crawl space cleanliness needs. 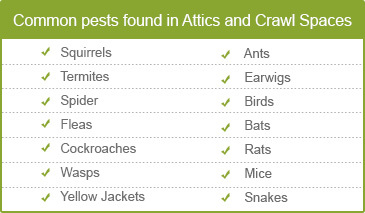 We guarantee to provide them a pest free and comfortable living space all year round. Give us a ring today at 201-205-2042 for a complimentary inspection and consultation.